Fact: Most Audiologists do not WANT to “SELL”. After all, you went to school to help people hear and live better. Not to SELL people. Right? Fact: Many hearing impaired people do not WANT to BUY a hearing aid. Patients do not want to bother with the inconvenience, feel older, OR spend the money. The conundrum of our industry. In order to stay in business, we have to consider the sales process. It is an essential factor of a healthy, successful, hearing care practice. (Of course we also want to do it in an ethical manner). and ultimately sell more hearing aids. This time our topic is Consistency -a powerful trait of behavior. Understanding Consistency, and the role that it plays in the buying decision, will help you effectively connect with your patients and ultimately sell more hearing aids. Personally, it bugs me when people do not follow through on a commitment. In fact, I’d say inconsistency is really high on my list of pet peeves, right up there with slow drivers in the left lane and a cold, rainy, summer! Conversely, I think people who are consistent (make a commitment and follow through with it) are generally more rational, assured, and overall trustworthy. I tend to immediately judge people who don’t put action behind their word as fickle, scatterbrained, and even unstable. Of course this generality NEVER applies to Beeman customers! 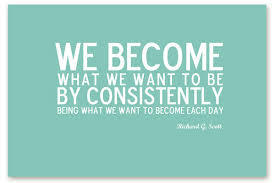 We use consistency to cut through the daily barrage of clutter and decisions that we face on a day to day basis. If we had to stop and weigh our decisions every time we perform a routine task it would drive us crazy and nothing would be accomplished. Do I use the toilet paper or the Kleenex to blow my nose? Should I use a bar of soap in the shower to wash my hands or the soap dispenser next to the sink? Is one better than the other? Hmmm… ….. Instead of over thinking every detail of every decision in our lives, our brains use consistency to cut through the clutter. Consistency is a coping mechanism that helps us navigate through our busy lives and make better decisions. It is important to methodically lead a new patient down a path to commitment. Not only does consistency make your patient look & feel good socially, but it makes life easier on your patient. Consistency is a powerful tool. You are using the power of consistency for good – influencing your patients – who badly need a hearing aid – to take that next step to a better life. You just need to take the proven steps of consistency to get your patients to “make good on a promise” towards better hearing health. Most people do not like to “go back on their word”. Nobody wants to be labeled fickle or unstable. Asking someone to speak the words – that they are ready to take a step towards hearing wellness (and a happier social / family life) – is one step closer to closing the sale. You are going to see much less “tire kicking” later on in the sales cycle. There is something almost magical that links a commitment to a good name – a written signature. Mr. Jones wants to keep his word and maintain a positive self-image, especially if he has gone on the record with his written word. After you have received a verbal “yes” – give Mr. Jones a document that states – as long as the recommendations fit within his budget – Mr. Jones is committed to working towards a solution to his hearing problem. Have Mr. Jones sign the document before you proceed with the hearing test. You should also sign it yourself, stating that you understand his complaints and that you will provide Mr. Jones with your best solution to his problems. As part of our call coaching service at Beeman Marketing, we tell our clients to always ask for a Third Party. One reason a Third Party is essential – it is basically peer pressure 101. Stating a commitment in front of a loved one is a huge step and one that we know is critical for closing sales. When Mr. Jones commits in writing to you, he is now making a public statement (in front of his wife) that he is committed to get help. If Mrs. Jones has come to the appointment, most likely she knows that Mr. Jones has a problem and wants him to get help. Mr. Jones does not want to hear the repercussions when he gets home if he commits to getting help and then walks out of your office without a hearing instrument. How can consistency do this? People have an inherit desire to align actions with beliefs. After you have received verbal and written commitment, found a loss, persuaded the customer that they do indeed need to buy hearing aids (more on persuasion best practices in our next blog!) and closed the sale – your next step is to re-enforce that great decision. The company LifeSource knows how to do this. And how about the “I voted” sticker during election time? Same idea. The voters feels good about voting. She wants to share this great decision and come back next election. Others see her sticker, praise her for voting, and feel the peer pressure to vote themselves. Get creative. Find ideas on Pinterest. “The more I LISTEN the more I HEAR”. Using the principles of consistency will help your practice sell more hearing aids, avoid returns, and have happier patients that will refer. Remember, you are using a proven sales tool to spread hearing wellness and make a difference in someone’s life. You are helping Mr. Jones accept that fact that he needs help... and influencing him to take action towards a better life.